Exploring Triton, Pyre’s third moon, spacers inadvertently activate an alien dome. When nothing came of it, they combined their mining ships with the Honora Belle, the aging colony vessel, to sling slush, frozen gases, at Emperion, Pyre’s second moon. 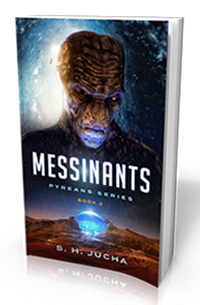 Read an excerpt from Messinants. Available in audiobook on Amazon and Audible and narrated by Nicole Poole.